Sadly there is very little information concerning Frank Young. He was born in Yeovil in 1896 but his parents are unknown and I could find no trace of him in any records. 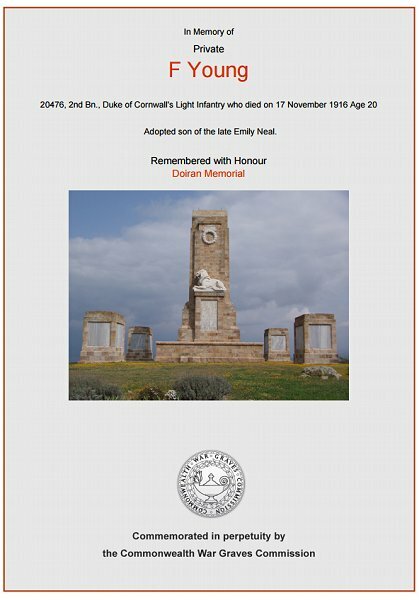 What is known is that he was adopted by Emily Neal of North Terrace, Newtown, but again I could find no trace of Emily in the records. According to the Western Gazette Frank enlisted at the outbreak of war. He enlisted at Yeovil, giving his place of residence at the time as Ilchester. He initially enlisted in the Somerset Light Infantry with the Service Number 6854 being recorded (this would appear to be incorrect as this number was issued in the regiment during late 1903). Although the Western Gazette reported that he had seen "much hard fighting", since his battalion within the Somersets is unknown his whereabouts during 1914 and much of 1915 cannot be determined. Frank is known to have been transferred to the 2nd Battalion, Duke of Cornwall's Light Infantry and his new Service Number 20476 suggests this would have been during late 1915. The 2nd Battalion, Duke of Cornwall's Light Infantry (and at this time presumably including Frank) embarked for the Balkans at Marseilles, France, in November 1915, arriving at Salonika on 5 December 1915. From this time on, the battalion fought in numerous actions against the Bulgarian Army. During the first four months of 1916 the British Salonika Force began building defensive works.. Large amounts of barbed wire were used and a bastion about eight miles north of the city was created connecting with the Vardar marshes to the west, and the lake defences of Langaza and Beshik to the east, and so to the Gulf of Orfano and the Aegean Sea. This area was known as the 'Birdcage' on account of the quantity of wire used. From October 1915 to the end of November 1918, the British Salonika Force suffered some 2,800 deaths in action, 1,400 from wounds and 4,200 from sickness. The action of the Commonwealth force was hampered throughout by widespread and unavoidable sickness since on one front there was a wide malarial river valley and on the other, difficult mountain ranges. Frank is known to have been hospitalised due to enteric fever. The Salonika Force dug in until the summer of 1916 and the Bulgarian attempt at invasion of Greece in July was repulsed near Lake Doiran. At the beginning of October 1916 the British, in co-operation with allies on other parts of the front, began operations on the River Struma towards Serres. The campaign was successful with the capture of the Rupell Pass and advances to within a few miles of Serres. Between 30 September and 2 October 1916 the 2nd Battalion, including Frank, were fighting to capture Karajakois (now Monokklisia in northern Greece) from the Bulgarians on the Salonika front. On 3 and 4 October the battalion was involved in hard fighting to capture Yenekoi (now called Provotas), 2km northwest of Karajakois. The final battle of 1917 in which the 2nd Battalion, Duke of Cornwall's Light Infantry were involved was the Battle of Tumbitza Farm which lasted from 17 November to 7 December 1916. Frank was killed in action on the first day of this battle, 17 November 1916. He was aged 20. In its edition of 16 February 1917 the Western Gazette reported "Miss E Neal, of 5 North Terrace, Newtown, has now received official notification of the death in action on 17th November 1916, in Macedonia, of Private F Young, of the Duke of Cornwall’s L.I., who prior to enlistment resided with her. Private Young, who joined the Army at the outbreak of hostilities, had seen much hard fighting and had previously been in hospital suffering from enteric fever. The deceased soldier was 20 years of age." Frank Young is commemorated on the Doiran Memorial, northern Greece, and his name is inscribed on the War Memorial in the Borough. The Commonwealth War Graves Commission certificate in memory of Frank Young.